PHOENIX – From the Baltimore Ravens’ Ray Rice to the Arizona Cardinals’ Jonathan Dwyer, cases involving NFL players are putting a national focus on domestic violence. To Jessye Johnson, chief operating officer for the Arizona Coalition to End Sexual and Domestic Violence, incidents aren’t on the rise. Rather, they’re finally being noticed. The Cardinals deactivated Dwyer, a running back, from all team activities Wednesday following his arrest on charges of assault and domestic abuse. The team announced Thursday that Dwyer was placed on the reserve/non-football injury list. Earlier this year, Cardinals linebacker Daryl Washington pleaded guilty to a domestic abuse charge. Unlike Dwyer, Washington has yet to be disciplined for that conviction, though he is suspended for the season for violating the league’s substance abuse policy. 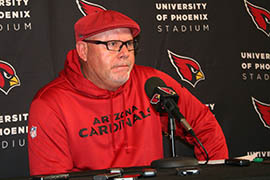 Johnson said the NFL and the Cardinals aren’t necessarily at fault for how Washington’s case has been handled. Johnson referred to a new NFL policy put in place last month. Players who commit domestic abuse will now be suspended for six games on their first offense, followed by a lifetime ban on their second. “We clearly saw them act swiftly with the Dwyer case and are pleased they are addressing it,” she said. Lorie Simms, communications coordinator for the Valley domestic abuse shelter Chrysalis, said this new policy is helping change the way people look at domestic violence. Simms said the best way to prevent domestic violence is through education and prevention at an early age. Since the NFL is targeting children as their next big audience, Simms argued that cases of domestic violence involving players should be a zero-tolerance issue. But another expert said changing the stigma of violence in the NFL won’t be so easy. Neil Websdale, a Northern Arizona University professor who directs the National Domestic Violence Fatality Review Initiative, said he was skeptical about an initiative to stop violent incidents in the NFL. “Contributing images of hypermasculinity while advocating anti-domestic violence … I don’t know how effective that will be,” he added. Websdale said he isn’t surprised that this kind of behavior is stigmatized in the football world, adding that he won’t be surprised if it doesn’t change soon. “If you sell a certain kind of violent masculinity and you ruin the bodies of these young men by pitching them against one another, it doesn’t surprise me that you have people who think violence is a way of solving their problems,” he said. 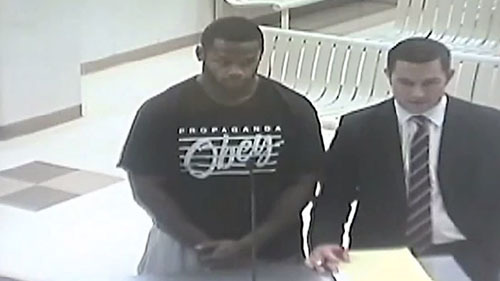 The recent arrest of Arizona Cardinals running back Jonathan Dwyer brings another case of off-the-field domestic violence by an NFL player into the national spotlight. Reporter Bethany Reed tells us why sponsors and fans aren't necessarily pulling their support from the team.